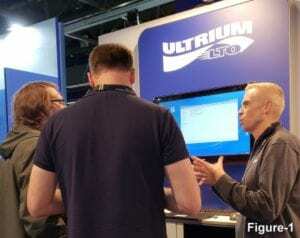 The LTO Program showcased LTO Generation-8 technology and the Linear Tape File System (LTFS) at IBC Show 2018 in Amsterdam. Broadcasters came buzzing by to see the tools in action. In this BlogBytes, we will take an insider’s look at what was on display at the LTO Program’s booth that created the buzz and walk through how one savvy user is maximizing their use of the technology in combination with the cloud. LTO Program representatives did some show and tell with LTO-8 tape drives attached to workstations loaded with LTFS and high-capacity LTO-8 cartridges. A variety of video media files were opened, copied, played and shared with ease. How? 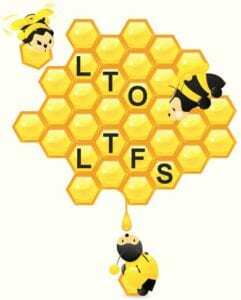 That’s simple – LTFS makes accessing tape files easy, like using a huge 12TB USB thumb drive or removable disk drive. In Figure-1, Eric Bassier, an LTO Program representative, shows post-production media executives how the LTO tape appears in the operating system directory tree, just like other storage devices. With a simple click of the tape icon, folders and files can be easily and intuitively accessed. How can you make even more use of LTO technology and LTFS tools? Read below on how one post-production servicer makes the most of a digital media workflow. LTFS can be utilized in small-to- large configurations consisting of a single tape drive or large tape library environments integrated with workflow and archive management applications. One such user is DigitalFilm Tree (DFT), a post-production, creative consulting and software development company. Clients of DFT include television, motion picture, independent producers and the technology industry. DFT wanted a cost-effective workflow solution that would work well on the front and back end of the production process. It also wanted data storage that would act as a protective archive for completed projects as production studios often need to recover certain video footage. 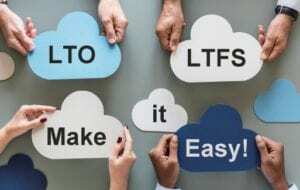 DFT implemented LTO technology with LTFS, which made files easy to locate and more interoperable, thus enabling more effective project collaboration. Using an OpenStack cloud computing platform, DFT was able to share LTFS archived versions of projects directly to the cloud. This allowed an additional location to protect content while maintaining the archived version on-site for quick access. Utilizing meta-data, DFT established workflows for clients to access their proxy files from cloud storage, as well as the associated high-resolution files living on tape. DFT is now able to provide tape-to-cloud-to-tape services and software for their TV, film and corporate clients. LTO technology with LTFS can help broadcasters, movie producers and any developer concerned about accessing and protecting rich media content while controlling costs. LTO technology also provides offline storage helping to prevent access by hackers and malware on-site and in the cloud. With LTFS, storing and accessing rich media is made easier than ever before. You can learn more about LTO technology and talk to the LTO tape experts at SpiceWorld in Austin, TX from October 8-10.